What is unique about AccurioPro Compile? Combine several single documents to a print project. 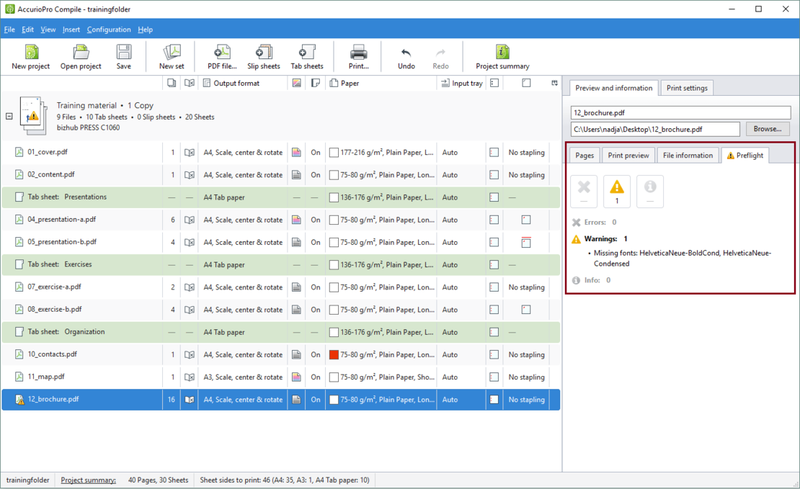 You can specify the print settings for each document individually and also insert slip sheets and tab sheets. Save the entire project to reprint it at any time. The single documents remain in their original locations and can be edited there as usual. When you open a saved project to reprint it, the current document version is automatically retrieved. You are always printing up-to-date data without having to exchange documents manually or having to create a new print project. The compilation of PDF files, tab sheets with their labels, the position of the slip sheets, the print settings for documents and deviant print settings for individual PDF files, simply everything that you have defined in your print project, is saved and can be retrieved at any time. It is no problem if the content of your documents need to be changed. Perform the changes in the source documents. Save the PDF file again in the same location under the same name and it will be available in you print project the next time you open it. 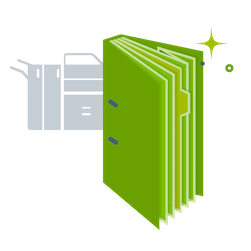 If several authors or several departments within an organization are working on one print project, they can prepare their documents independently of each other and make them available as PDF files. In AccurioPro Compile, you can retrieve those PDF files from their individual locations and compile them into one final document. 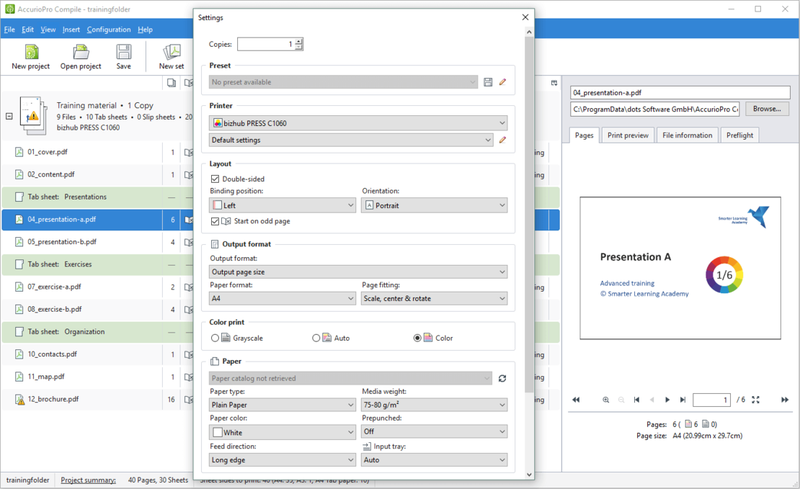 If you always use the same settings for the processing of the documents, the finishing and the printer settings in your projects, save them as templates. If you now create a new project, you can select the saved settings instead of having to make them manually. It will save you lots of clicks and lots of time. Create customized documentation. Select from a print project only those files that you want to compile individually for a customer as new documentation. In addition to printing the selected files, you can also easily save them as a PDF file. So you can respond to individual customer requests. 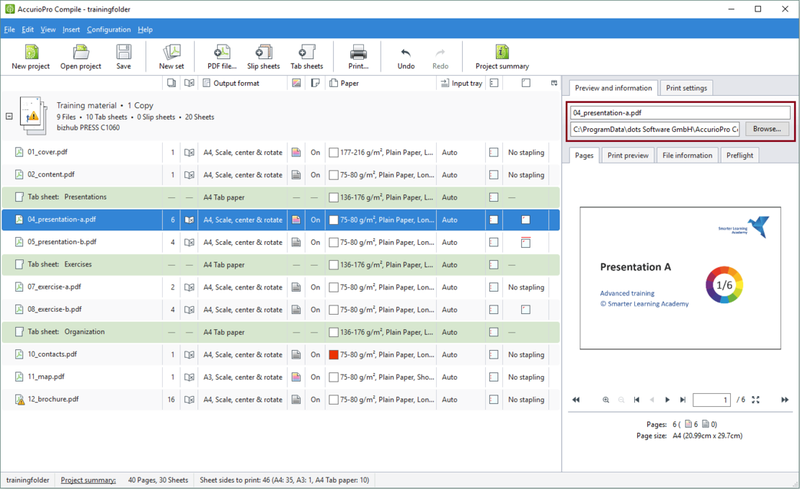 If your print project consists of PDF files with different paper formats, you can select whether these formats are to be retained for the output or scaled to a specified output format. You can also print brochures easily. In regular software training courses, we train our colleagues from Konica Minolta's national organizations. Our goal is to enable them to support our customers on-site in the best possible way. 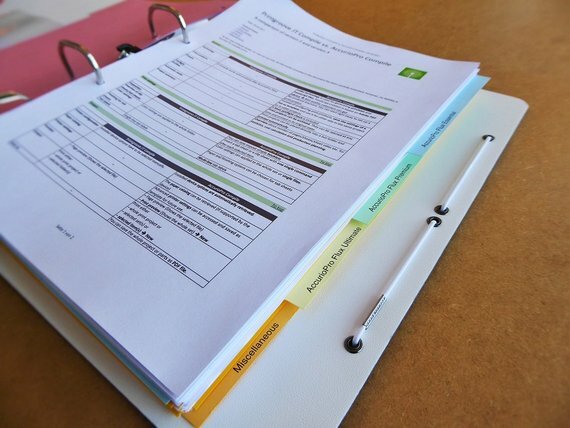 An important tool during these courses is an extensive training folder, which each participant receives. The folder contains instructions, exercises, presentations and information material, arranged by topic with the help of tab sheets. The documentation is regularly updated as changes occur with every new version of our software solution. Our training team uses AccurioPro Compile to organize and print the documents and is thrilled by its advantages. Even if the documents need to be updated, they can continue to use the existing printing project unchanged. As long as the updated documents are saved in the same location under the same name, the print project is always up-to-date. The settings do not have to be changed. So when a training course is scheduled, they only need to start AccurioPro Compile and hit the print button. The updated documents are automatically retrieved and printed. 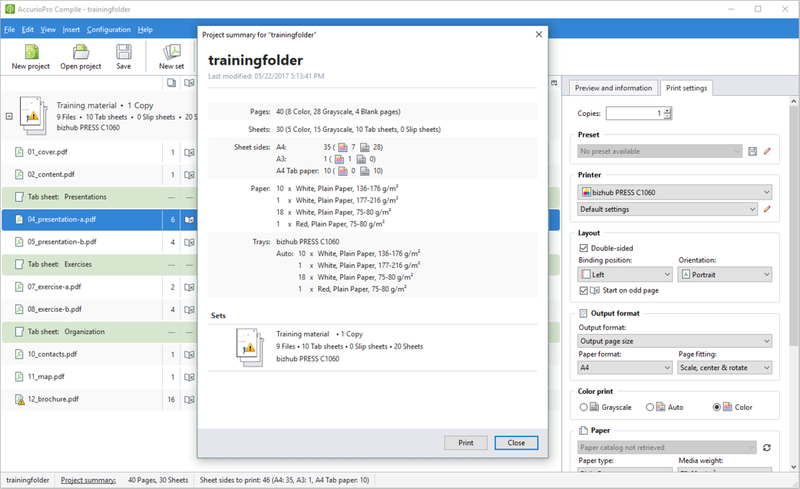 The print result is the assembled content of a training folder, complete with all the labeled tab sheets. We keep improving our software. You can benefit from future features with a Software Maintenance Plan (SMP). It includes free updates, upgrades and service releases. We have been developing software solutions for production printing for 20 years. That means 20 years of experience, continuous development and permanent user feedback. AccurioPro Compile is distributed by Konica Minolta within Europe.